School is finally letting out and you know what that means… Its SUMMER! Summer means fun in the sun and with three little kids I’m always looking for swimwear that is affordable, cute, and keeps the kids protected. Little Me is perfect for your growing baby or toddler with bathing suit sizes ranging from newborn up to 4T. I have to say that I really love these pieces on my kids. I am totally impressed! My middle daughter is three-years-old and super tiny. I always have a really hard time finding things that fit her without being too saggy or tight. I ordered her a 4T swimsuit. It fits great and covers her tush (a lot of bathing suits these days for kids are so revealing and I just don’t care for them at all). 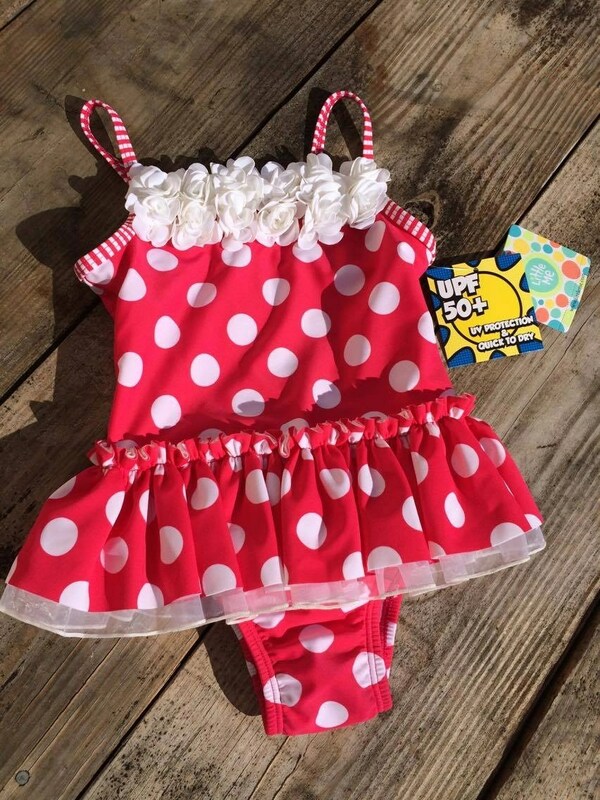 This adorable little Dottie Swimsuit reminds me of something from the 60’s with its bright red base and white poke-dots. The white flower accent at the top gives it that perfect pop! Just like for adults, a well-fitting suit is very important so that all you have to focus on is the fun without having to adjust the suit often. For boys Little Me offers separates as well as one-piece boy swimwear. 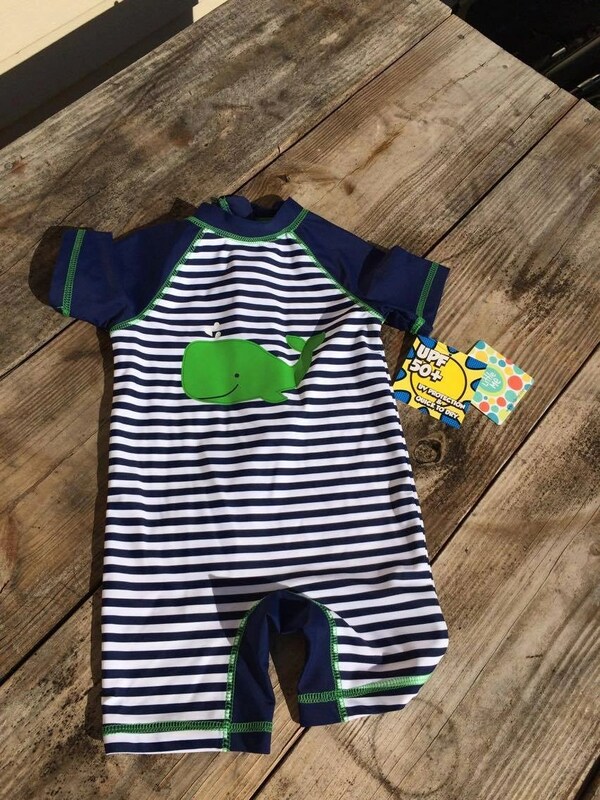 I chose a one-piece swim romper for my little man who is 19 months and wears a size 24 months clothing. This is the perfect fit for my little sailor man! I was worried about how it would fit over his cloth swim diaper because all the other swimsuits I have for him are super tight with it underneath. This fits great and isn’t tight at all in the crotch area. My little guy is very fair-skinned so I’m always looking for things that will give him extra protection against the sun. This suit gives him an extra 50 UPF. To me this outfit is straight up twenty’s retro in theme and I adore the way it looks. The big whale in the middle sets off the stitching around the arms and legs. I find it absolutely adorable!! All in all, I really love these suits. 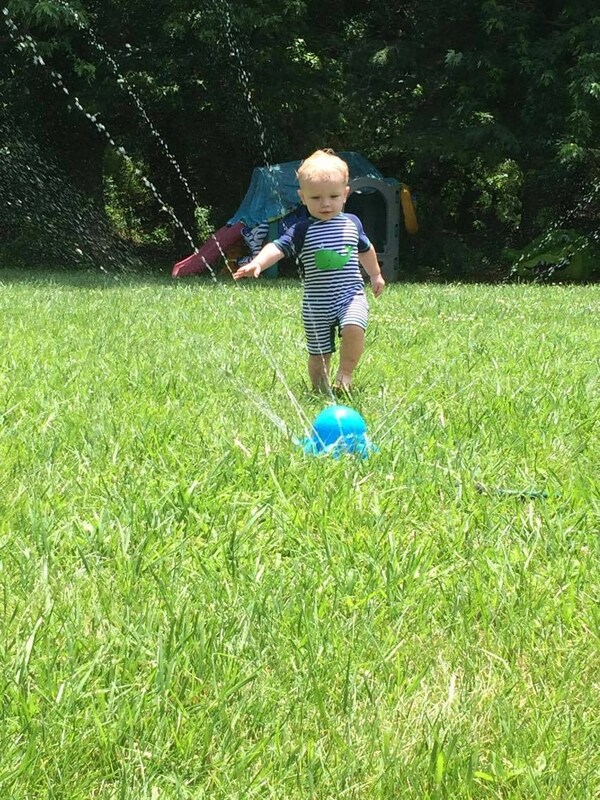 They are great for the beach or just playing in the sprinklers at home. They come in several different styles that you and your little one are sure to love. They are super soft and easy to clean. A must have for your summer style. Do you still need swim suits for your little ones? Let’s get this summer started! Oh, so cute. The polka-dot suit is so darling. They have the cutest clothes for babies and toddlers. Even boy clothes are prettier. I have no little ones but oh my goodness these are adorable! I love the little whale on the front! These are so cute! I love that they have SPF. 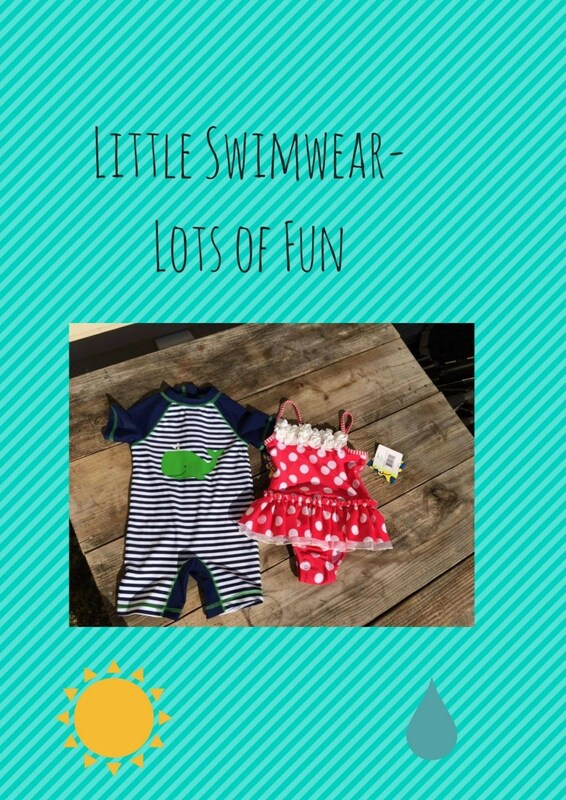 My grandchildren are set for the summer with swimwear but the Little Dottie one makes me want to shop some more…..
Those are both so cute. 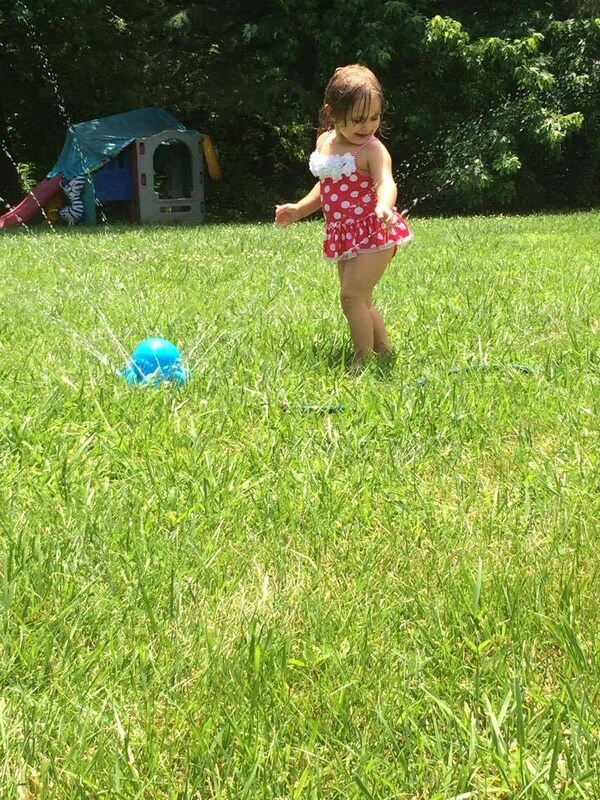 I love the polka dot girls swimsuit. These outfits are just darling, I love them all. These are so adorable! Thanks for posting about them. Oh my goodness! They are precious and I love the swimwear. Kids swimwear is always so fun to shop for! These are so cute. I love the red swimsuit. So very cute. Those are so cute! I think our grandson would look great in the one you got for your little guy.